TRIPOLI, LEBANON — Clashes are intensifying on the aptly named Syria Street in the northern Lebanese city of Tripoli. The clashes between Sunni Muslims, who back the rebels in the civil war raging in next-door in Syria, and Lebanese Alawite Muslims, who support their co-religionist Syrian President Bashar al-Assad. There have been more than 20 serious clashes recently between Alawites perched on a hill overlooking the Sunnis. Five people have been killed and more than 50 wounded in the last five days in the fighting. The clashes on January 21 following the bombing in Beirut were particularly fierce. There are no signs that the warring cheek-by-jowl communities will tire and cease their episodic and prolonged confrontations, clashes that are adding to sectarian tensions roiling Lebanon. Syria’s sectarian civil war has aggravated the old feud between the communities. 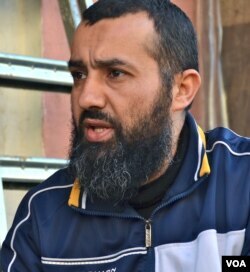 “Lebanon is deeply intertwined with what is happening in Syria and if the Geneva talks reach a final resolution where Bashar al-Assad leaves and the whole regime leaves, then we will definitely have no more problems,” says Abu al-Bara, a local Sheikh who commands a group of 40 Sunni fighters. The father of five is married to a Syrian. That is not unusual -- many Sunni and Alawites here are related to Syrians or marry them. But he says since August last year when two Sunni mosques in Tripoli were bombed on the same day leaving 42 dead and hundreds wounded “there have been no relations at all and if we know someone of us has contacts with them that person will have trouble,” he says ominously. The government in Beirut has struggled for months to try to limit the repercussions from the vicious warfare raging in Syria and to avoid that conflict reviving the Lebanese civil war —a crisis that left 120,000 Lebanese dead and a quarter of the population wounded. In many ways Tripoli acts as a barometer as to how well the Lebanese government is doing and the flare-ups normally tie in with events in Syria or some sectarian bombing or fighting elsewhere in Lebanon. In October 2012, the army managed speedily to impose order when sectarian clashes in Tripoli erupted following the assassination in Beirut of Lebanese security boss Brig. Gen. Wissam al-Hassan. And in December 2012 there was another severe uptick of violence in Tripoli when four days of fighting were triggered after 21 Lebanese Salafists from the militant group Fatah al-Islam—a group linked with al-Qaida—were killed in an ambush by Syrian army units in the Syrian town of Tal Kalakh near Homs. The Lebanese Salafists were on their way to joining a rebel unit in Syria. But with Lebanon adrift with a fragile caretaker government and politicians squabbling over the formation of a replacement, tougher action beyond trying to contain the fighting seems unlikely.